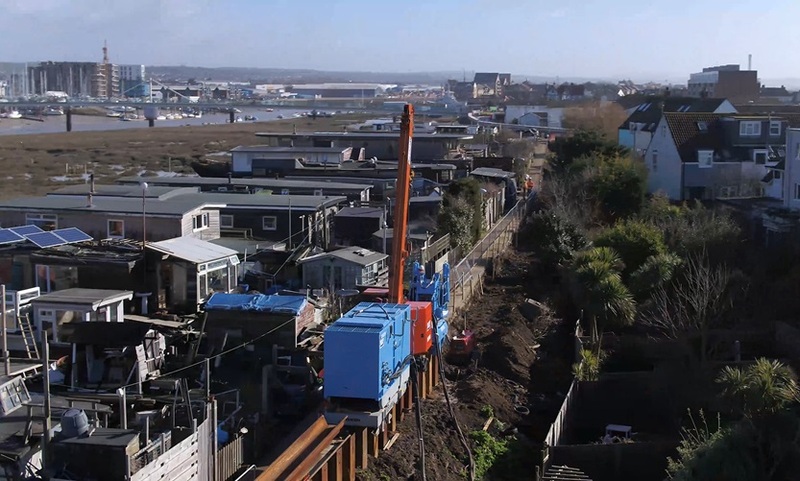 With only a few months until the scheduled completion of the Shoreham Adur Tidal Walls scheme, Team Van Oord has published a progress update. 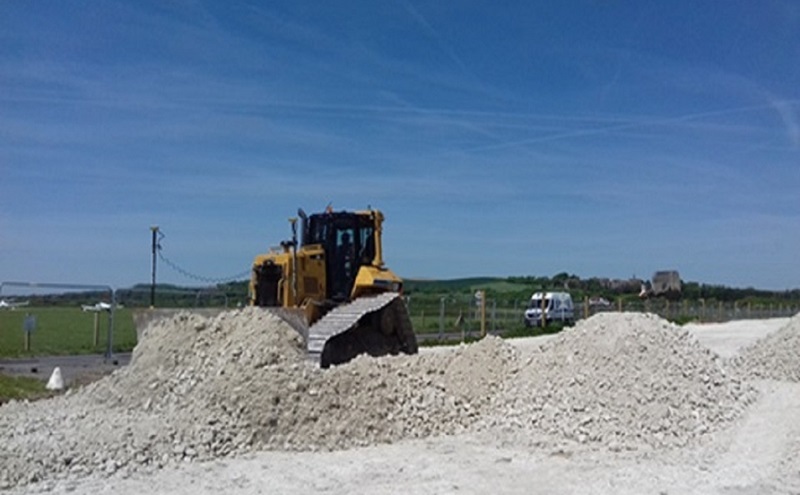 The Shoreham scheme is being carried out by Team Van Oord on behalf of the Environment Agency, Coast to Capital Local Enterprise Partnership, Adur District Council and West Sussex County Council. 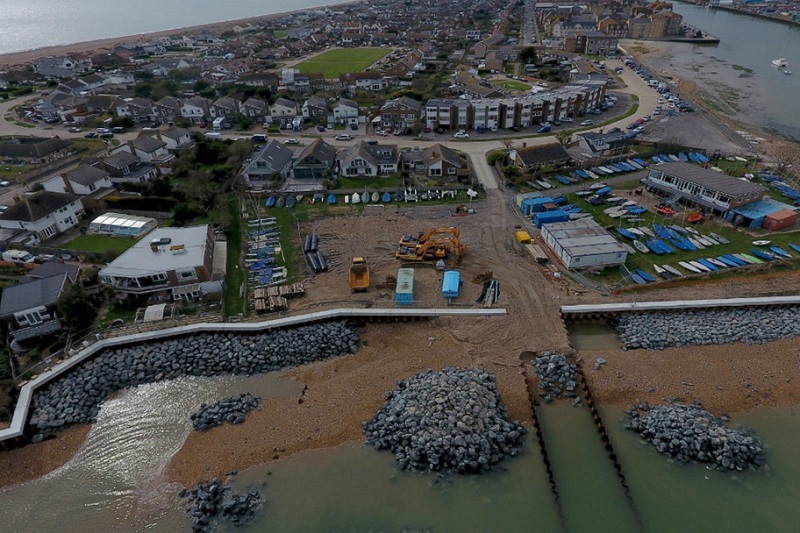 Work on site commenced in October 2016, and when complete the scheme will significantly reduce flood risk to more than 2,300 properties in Shoreham and East Lancing – as well as protecting important local infrastructure such as the road network, railway line and Shoreham Airport. The scheme is separated into 10 reaches, or lengths of the estuarine bank. The new defences include steel sheet piling, concrete walls, flood glass and earth embankments. The Fort car park is currently being improved and this work is expected to be complete in the near future. The picture below (taken in April 2018) shows work at the Sailing Club in progress. Team Van Oord is now much more advanced but this aerial photo puts the construction into perspective. The flood defence is largely complete and the new slipway is complete. Work to Emerald Quay slipway is complete and the slipway is open. The flood glass at Emerald Quay has been installed. There are some small finishing works left to do but Team Van Oord hopes to be finished at this reach shortly. Piling work is very advanced with the concrete works well underway and work has started on the tie-in to the footbridge. The flood defence is mostly installed, and reinstatement works on the gardens is underway. The new steel sheet-pile wall with brick cladding and flint insets has been completed and the flood gate adjacent to the Waterside Inn has been installed. The tie-in to W5 Riverbank is in progress. During this work, part of the footpath at Lower Beach Road will be closed. Construction started this year and the piling works are complete. A technique known as a Giken piling rig – suited for work in tight spaces – was used in this reach. Known as the ‘Giken train’, it uses hydraulics to push the piles into the ground. The riverbank footpath is closed to the public and will remain closed for the duration of the work. The next step, which is currently in progress, is the concrete works: concrete capping around the sheet-pile wall and a layer of concrete to raise the footpath. Brick cladding is being added to the concrete surface for aesthetics. The flood defence is complete and open to the public, with the exception of a stretch next to the railway bridge – which will be completed shortly. Construction on the flood embankment has commenced and is progressing well. For the duration of works the footpath running riverside of Cecil Pashley Way, between the railway bridge and the Old Shoreham Road, will be closed to the public. The works involve a short section of sheet piling in the northern section (near Almond Way) and a long realigned flood embankment. There will be a new improved footpath on top of the new flood embankment. After the new defences are complete, the old embankment and footpath will be removed. The flood defence between Star Gap and Oyster Quay is complete. Work to install a new concrete flood defence wall that ties into the existing Ropetackle development and the Network Rail bridge abutment is nearing completion. Works to the north of the Amsterdam pub are complete and the northern section of the Downs Link is open to the public. The southern section of the Downs Link is closed while work is undertaken to the section of the flood defence under the railway bridge. Work to complete this section of the defence will be completed soon.